The opulence, art and culture of Europe enamored Peter I. 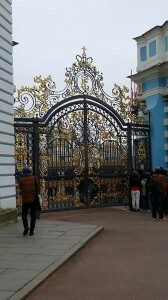 He built the palaces at Peterhof to rival the French Versailles. After Peter’s death, his daughter, the Empress Elizabeth greatly expanded the palace and the gardens. 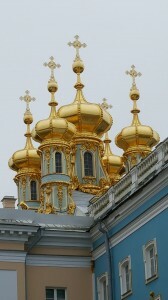 Close up of the gilded cupolas. The gardens are outstanding, thanks to Elizabeth, but it was Peter’s imagination with things like the Trick Fountains, is what makes the gardens so unique. 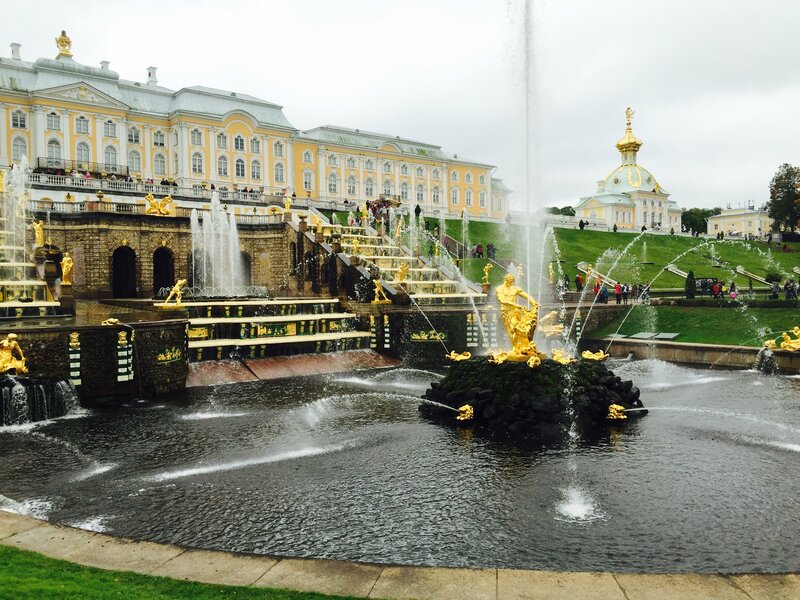 When foreign dignitaries visited Peterhof, they were surprised by a shower from hidden fountains. 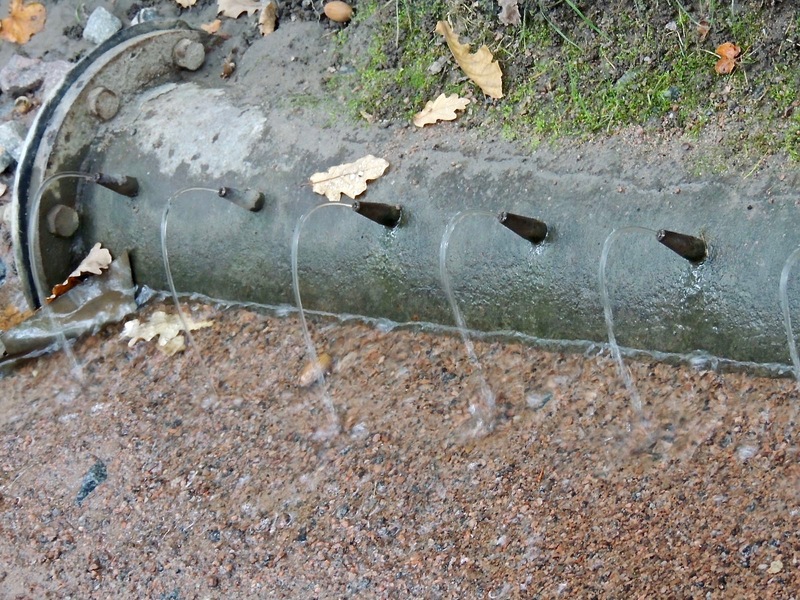 These fountains would “wash” the visitors. During this period of history the frequency of bathing was minimal. Peter’s goal was to increase that frequency in a humorous and unexpected way. Annie trying to navigate the path without getting wet. Unsuccessful! Notice the small, green building at the right-side of the photo. 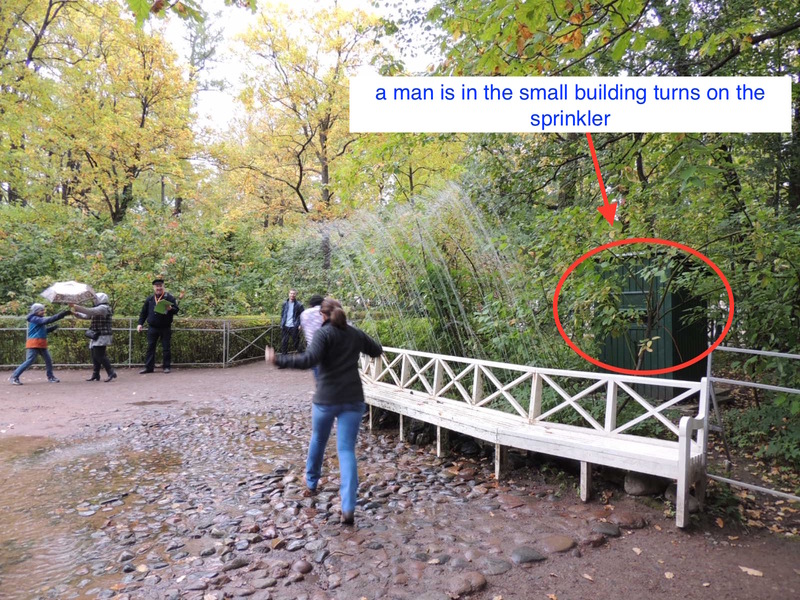 A man sits inside the building and when an unsuspecting visitor walks down the path, they get wet. In the center of the fountain is a statue of Samson defeating the lion. The statue represents Russia’s defeat of Sweden in the Great Northern War. Think of it as the Colonists defeating Britain in the American War for Independence. Before the German invasion during WW II, the Russian people made an effort to hide Peterhof’s statues and valuables to prevent the Germans from destroying the icons. Some of the buried treasures still haven’t been uncovered. 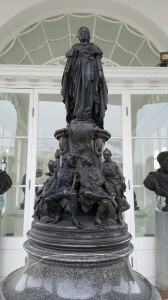 The first statue at Peterhof. 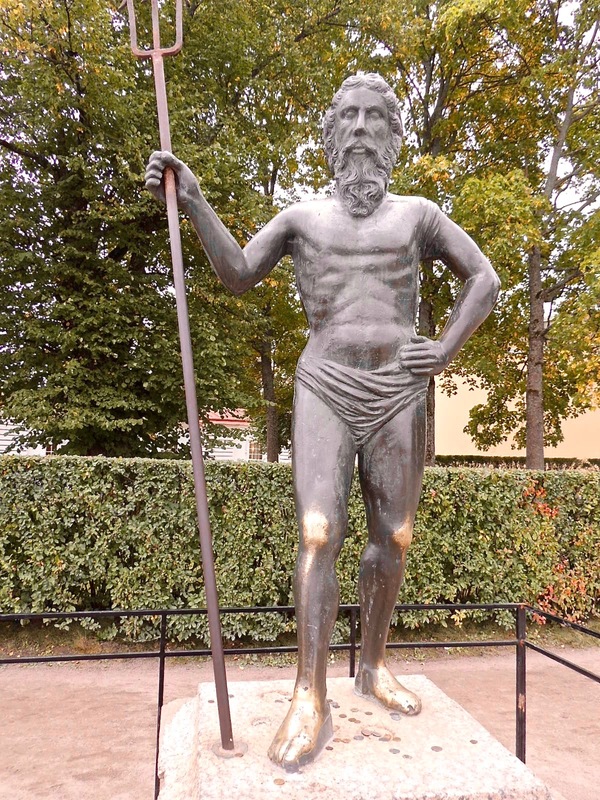 Neptune looks out toward the Gulf of Finland. Visitors make a wish, rub Neptune’s feet and leave money. Catherine Palace is located in Tsarskoe Selo (Pushkin), about 16 miles from St. Petersburg. Tour bus, private car or train are popular means of arriving at this summer residence of the Russian Tsars. Catherine I, second wife of Peter I, was empress of Russia for two years after Peter’s death. She died at the young age of 43 of Tuberculosis. She was of humble birth, but her beauty attracted Peter, who enjoyed her cheerfulness and cooking. In 1717, Peter had a simple, two-story building constructed for his wife. Empress Elizabeth, daughter of Catherine and Peter, had the original building torn down and the opulent palace built. Elizabeth was fond of baroque style design. Catherine II’s preferred neo-classical design. One of the most interesting contrasts of the palace is the different styles of Elizabeth (baroque) and Catherine II (neo-classical). Gold vs. subtle elegance. Catherine II’s tastes were more like her grandfather, Peter I. She deplored the excessive expense that Elizabeth lavished on the palace. 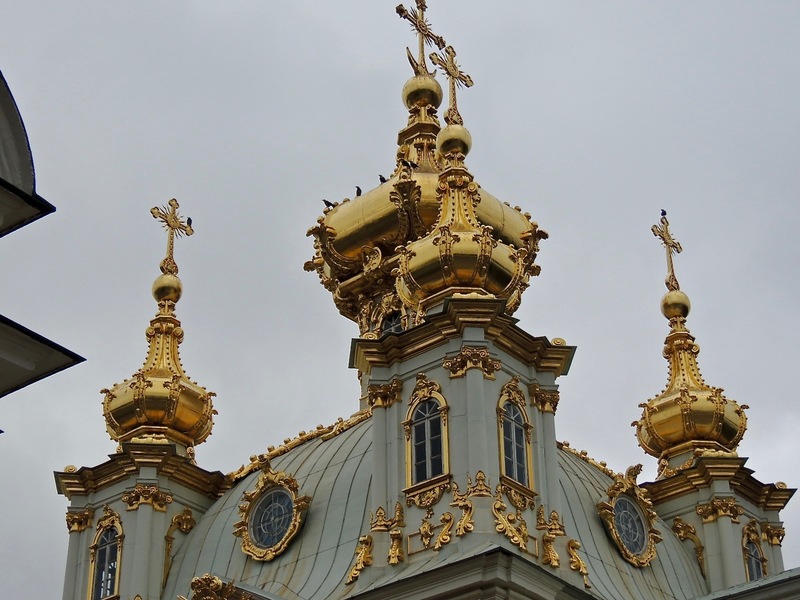 Elizabeth used an estimated 100kg of gold to gild statues and facades. When Catherine the Great (II) came to power, she halted the extravagant spending of state and private monies. Catherine II moved the original spiral staircase from the southern part of the palace to the center. 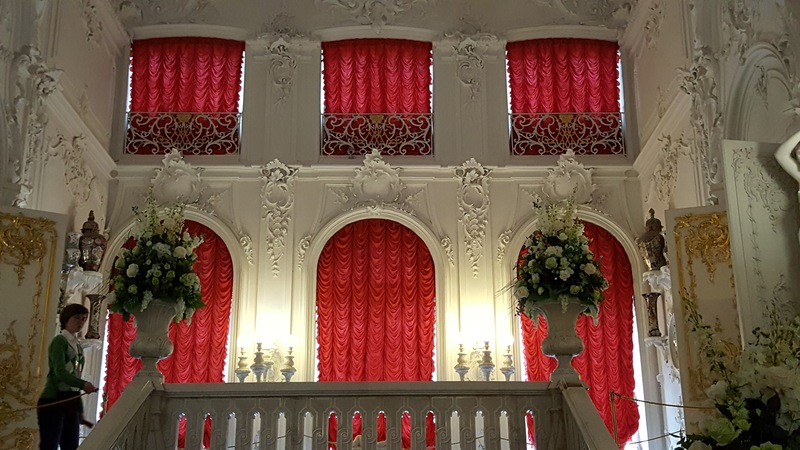 Charles Cameron, her favorite architect, designed the staircase to flow into the baroque furnishings initiated by Empress Elizabeth. The clock and barometer on one side of the staircase were inventions ahead of their time. 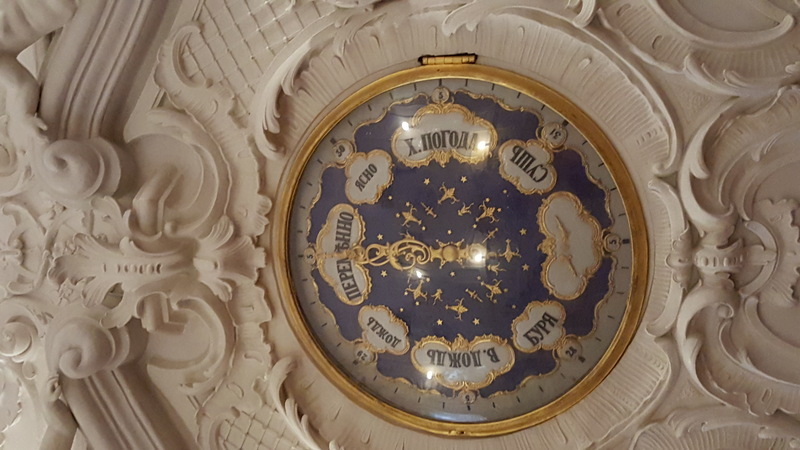 The clock and barometer located on one side of the staircase opposite Chinese porcelain which was popular during the time. 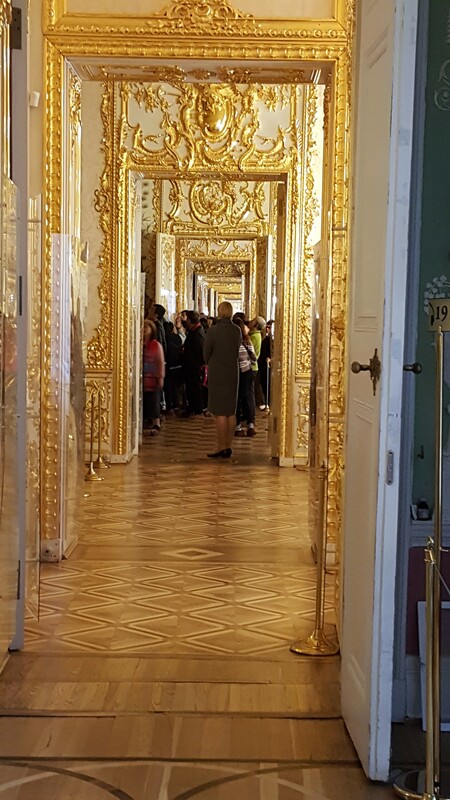 The Amber Room is a tourist favorite. The story of the Amber Room begins with a gift of an amber study from Frederick William I of Prussia to Peter I. 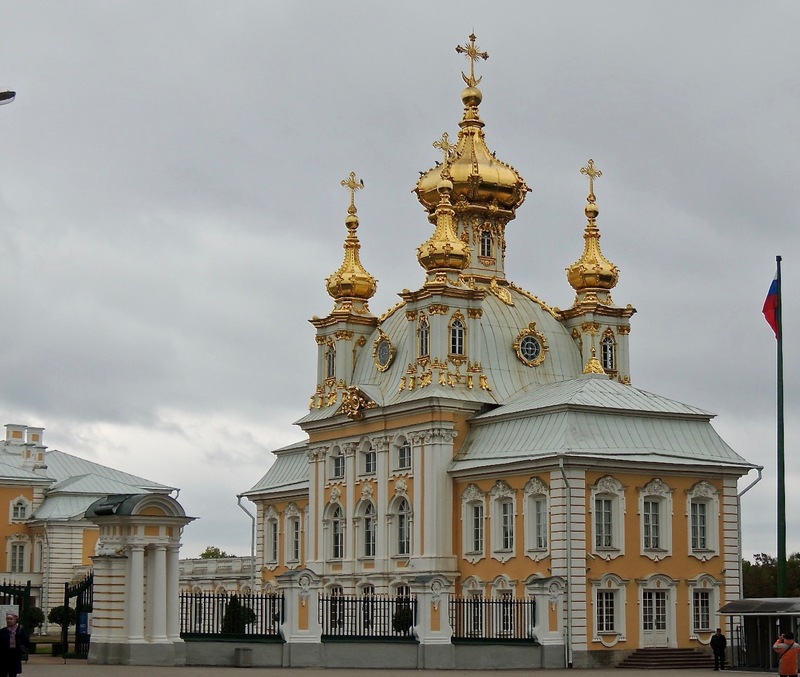 Empress Elizabeth was responsible for moving the amber panels from St. Petersburg to Tarskoe Selo. Because heat can melt the amber, no photos are allowed. The amber had to be repaired periodically. Then, in 1941, the Germans invaded. 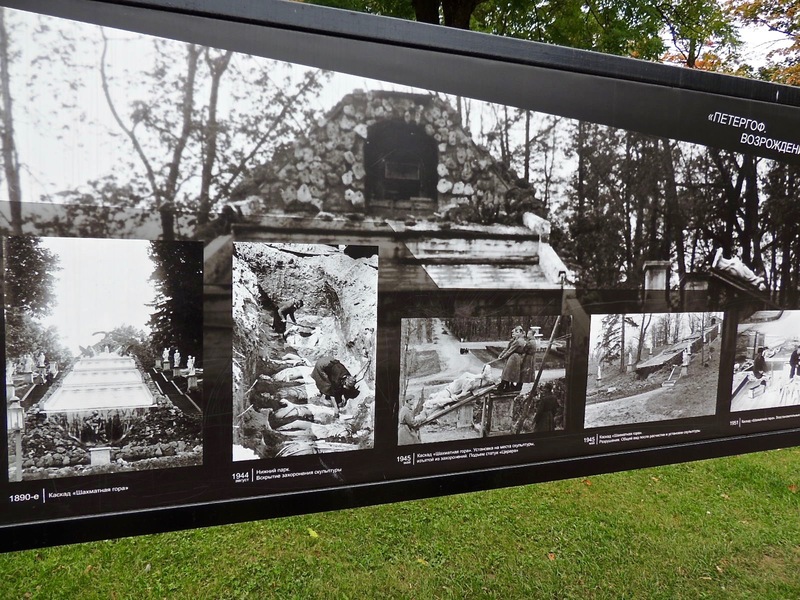 They removed and crated the amber panels and sent them to Konigsberg Castle. There are records that the panels arrived. However, with the fall of Germany, the panels disappeared and to date have never been found. 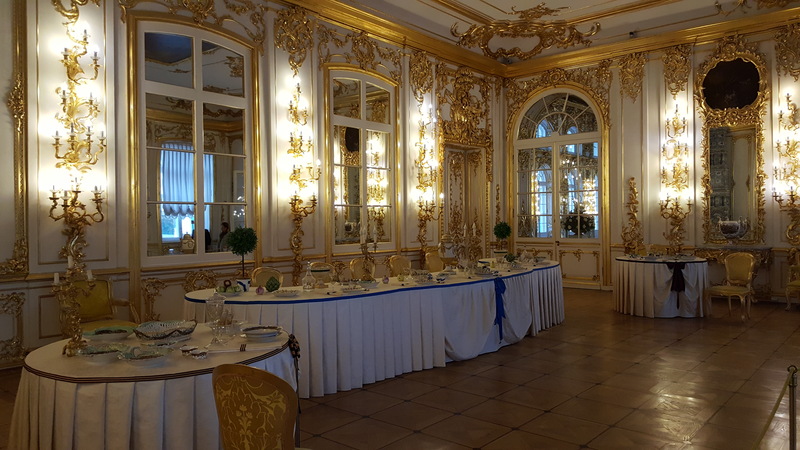 In 1979, the Soviet Union voted to duplicate the Amber Room. Twenty-four years later, the Amber Room opened to visitors. 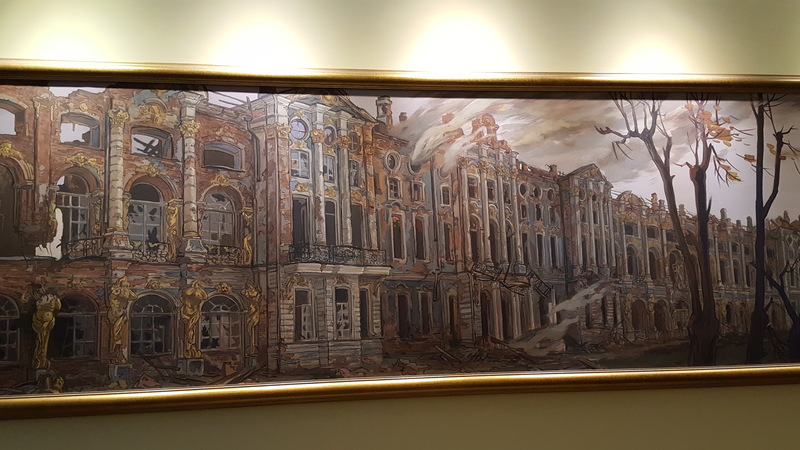 Painting of Catherine Palace after the German invasion of WWII. The palace was ransacked and burned. The Germans sacked and looted Catherine Palace during WWII. 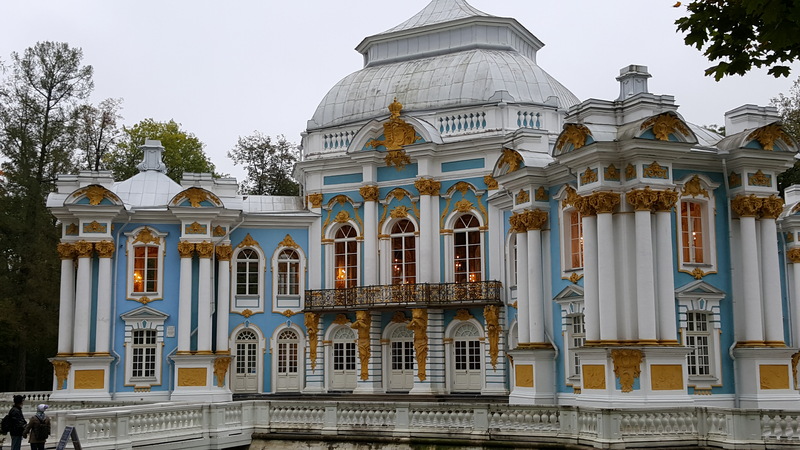 All that remained of Catherine Palace was the facade. 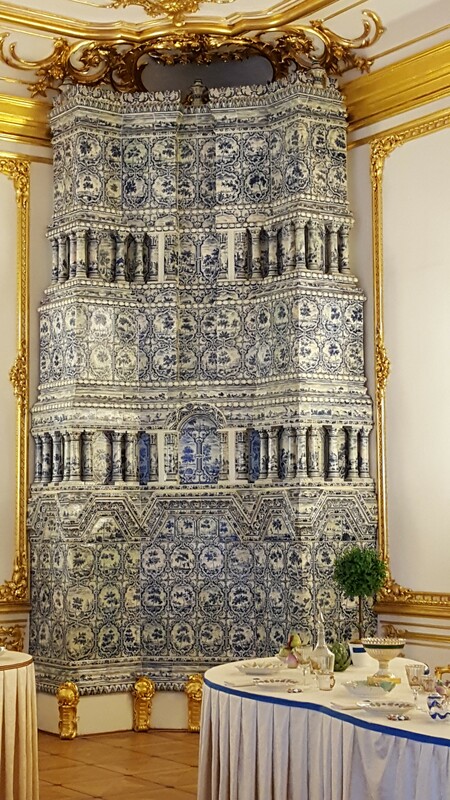 Delft (Dutch) tiled heater. They appear in most of the rooms. Peter I liked the Dutch delft tile so much that he traveled to the Netherlands and apprenticed to learn how it was made. Then, he brought back the technique to Russia and taught Russian craftsmen how to make the tiles. 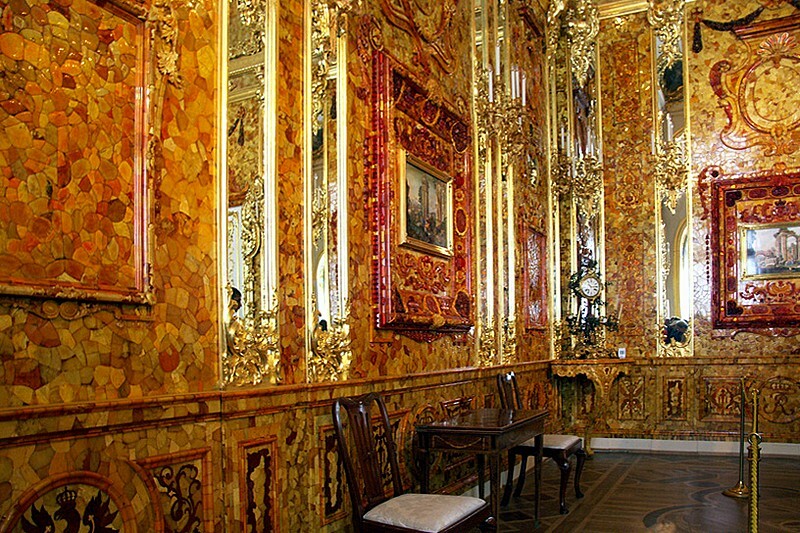 You would think that the Amber Room or the opulence of the Great Hall would be my favorite. But, actually, for me, these heaters represent a joining of beauty, functionality, and engineering achievement. Empress Elizabeth used the white state dining room for evening meals with close friends. 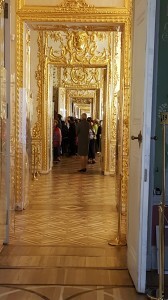 Looking down the hall at the succession of golden opulence. This photo is like a painter’s horizon perspective. The ornate gold flows from room-to-room. 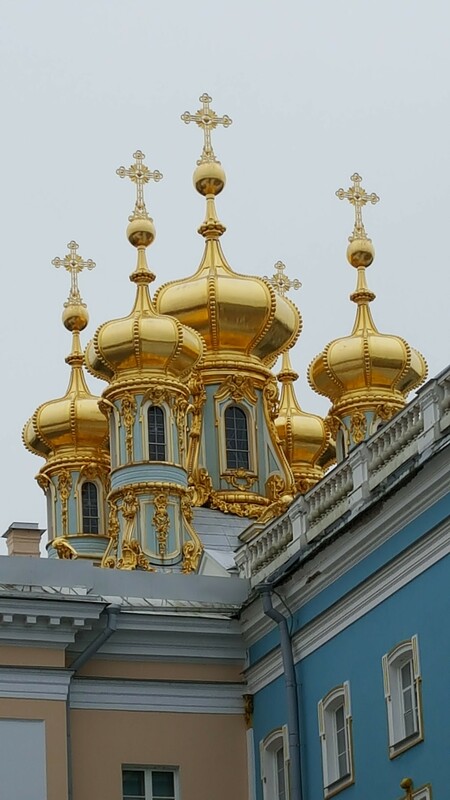 Close-up of the Palace Chapel cupolas. At the end of Catherine the Great’s life, she was unable to walk. She was in a wheelchair. She enjoyed the outdoors and had her favorite architect, James Cameron, build what is called the Cameron Gallery. Her attendants could wheel her directly from the palace to the gallery where she could view the pond and nature’s beauty. View of the pond from the second floor of Cameron’s Gallery. On one side of Cameron Gallery is a statue of Catherine II. The figures around her are said to be her lovers. 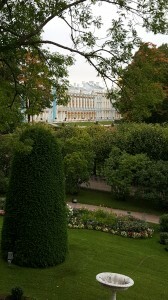 View of Catherine Palace from Cameron Gallery. 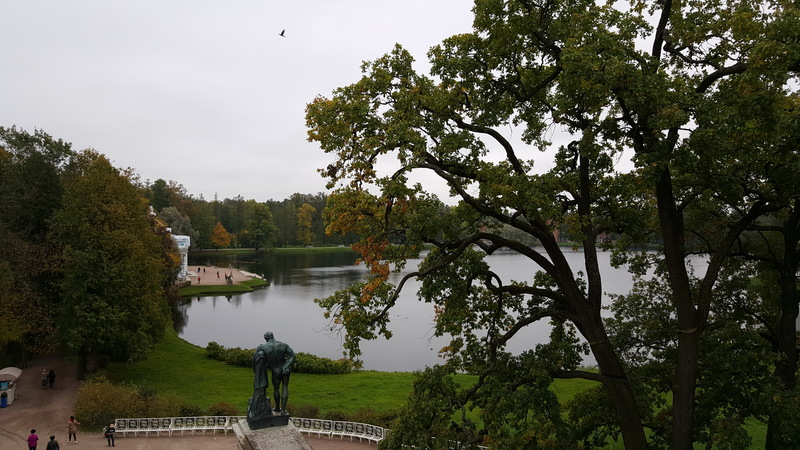 I’ll conclude our visit to Catherine Palace with this tranquil photo taken from the second floor of the Cameron Gallery. Note: If you visit Peterhof and Catherine Palace on the same day, it can be difficult to keep the two palaces separated in your mind. 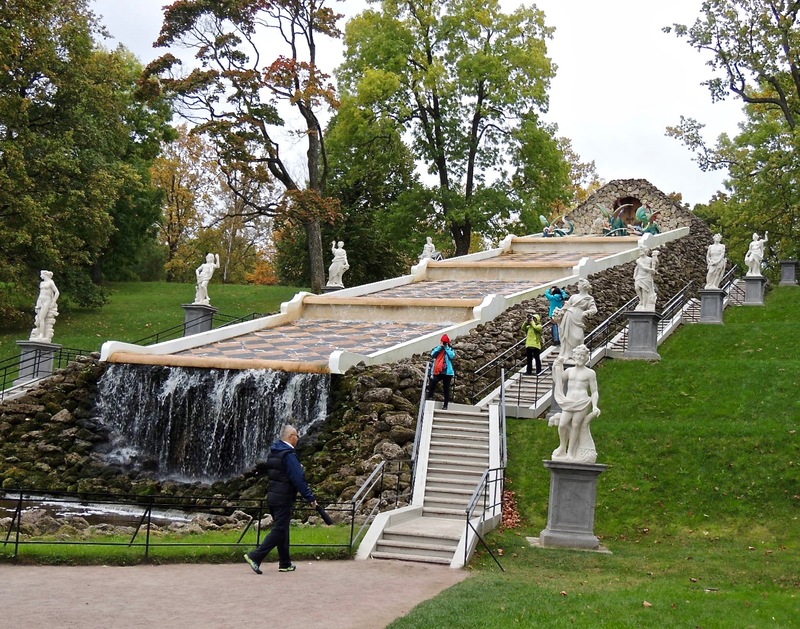 Think of Peterhof as the palace of amazing gardens. 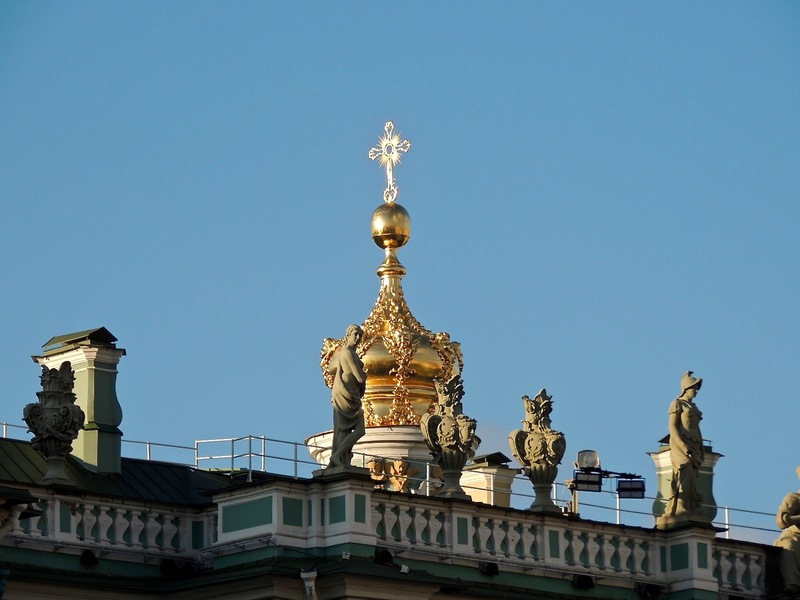 Think of Catherine Palace as the palace of gold and amber. 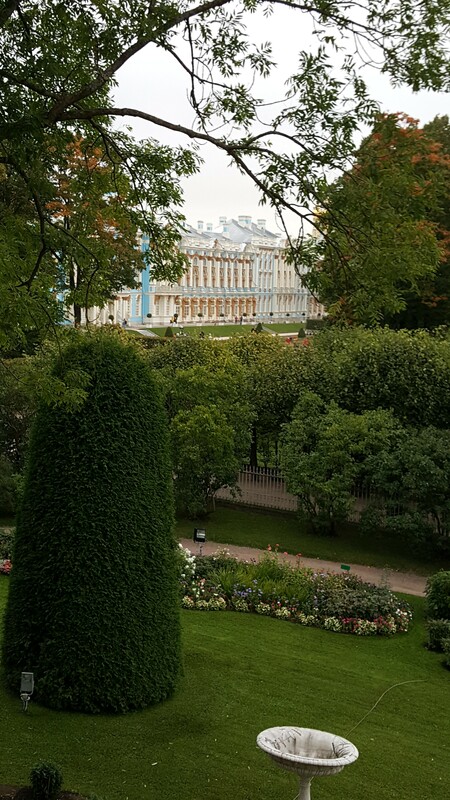 The Hermitage is the premier tourist attraction in St. Petersburg. 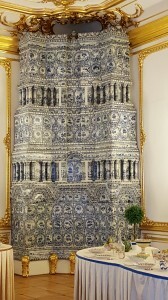 More important than a tourist attraction is that the Hermitage is the soul of Russia. The museum cradles Russian history. Originally, the Winter Palace of the tars, now a world renown museum. Catherine the Great sowed the seeds for what it is today. She purchased paintings world-wide and as the artwork outgrew the space, she expanded the buildings. 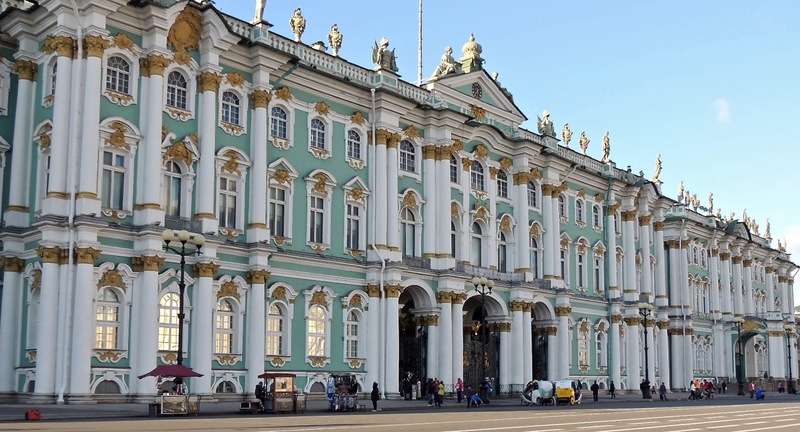 The Hermitage contains one of the most impressive art collections in the world. Catherine II wanted to bring Russia to the level of European countries. Three million people visit the museum annually. 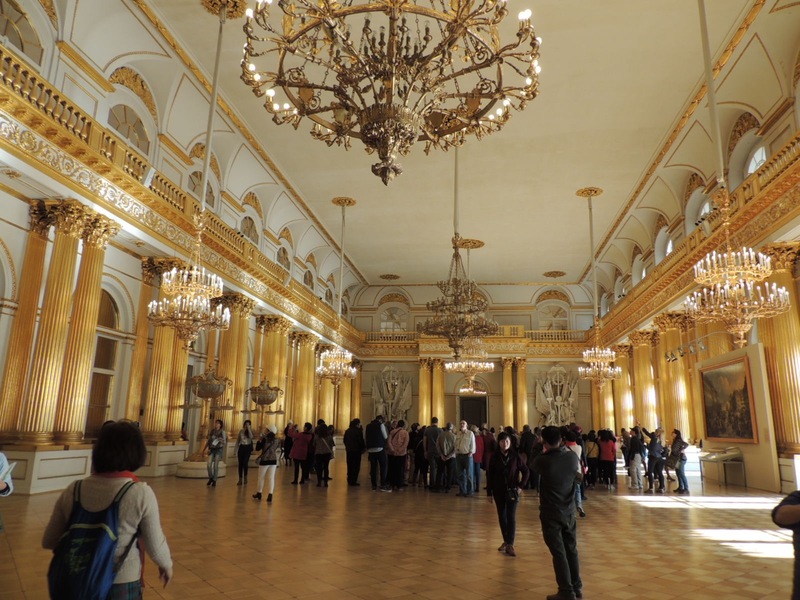 When Veronika and I were touring the museum, she took me to a hall, which contained the portraits of all the tsars. She explained each one and some history associated with that tsar. This helped me better understand the Romanov lineage. If history is of interest to you, I recommend a visit to the portrait hall. The Victory Chariot statue to commemorate Russia’s triumph over Napoleon. 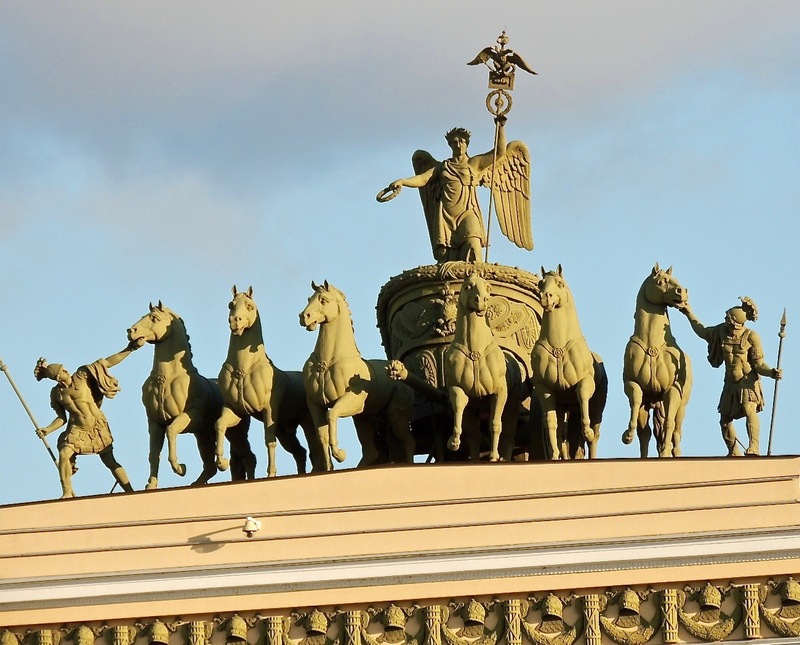 Nicholas I changed the architectural appearance of the Palace Square by adding this statue atop the triumphal arch to commemorate Russia’s victory over Napoleon. 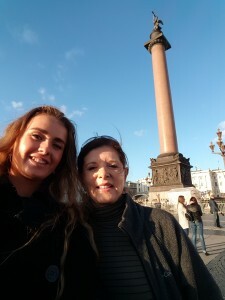 Annie and Veronika in front of Alexander Column which sits in Palace Square. Veronika and I walked around Palace Square where many Russian historical and musical events have taken place. In the center of the square is the Alexander Column (155 ft. or 47.5 m tall). 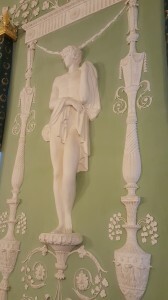 At the top of the column is an angel holding a cross. The Russian defeat of Napoleon was a major success. The column (just like the Victory Chariot statue) commemorates this victory. The column was constructed from a single piece of red granite. This is a video of a video of the Peacock Clock, one of the most enjoyed exhibits at the Hermitage. Created by the British jeweler, James Cox, this remarkable piece of engineering was bought for Catherine II by her lover, Grigory Potemkin in 1777. The clock was to impress people more than tell time. Every Wednesday at 1:00 p.m. the animated peacock, owl and squirrels play music and move their heads and tails. This beautiful piece is located in the Pavilion Hall, also known as the Small Hermitage, where Catherine held her more intimate dinner parties. Armorial Hall was a main area for entertaining. 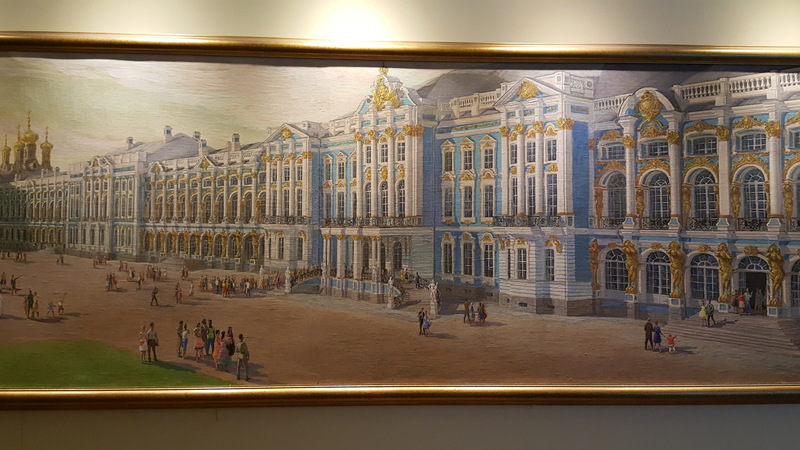 In 1837, a fire badly damaged the Winter Palace. Vasily Stasov redesigned the hall and reconstruction was completed in the late 1830’s. The chandeliers and columns are bronze. St. George’s Hall thorn room. 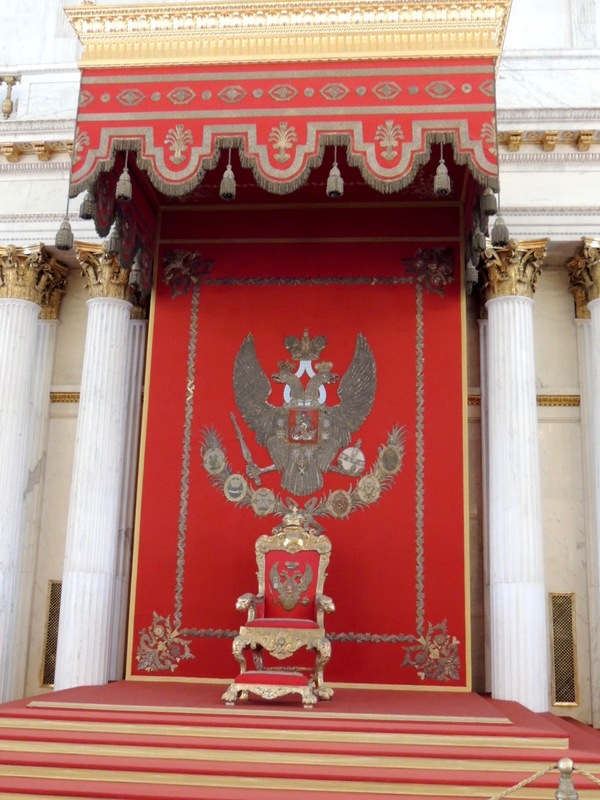 During my visit, I took a photo of the throne; but, unfortunately, not of the elegant room the flows from the throne. You will have to see it for yourself. The fire of 1837 destroyed this room as well. Stasov redesigned this hall also. Many notable formal royal events took place in this hall. I only had three days to see St. Petersburg. In a city with this much history, three days would be a beginning. Before the trip, I searched the internet to find tours for the various landmarks. What I found was disjointed…a day tour here, a half-day there. So much was being missed and precious time wasted. As luck would have it, I found the website, St. Petersburg Essential Guide, owned by Davide Castellucci and Anastasia Druzhevskaya. Both speak excellent English. 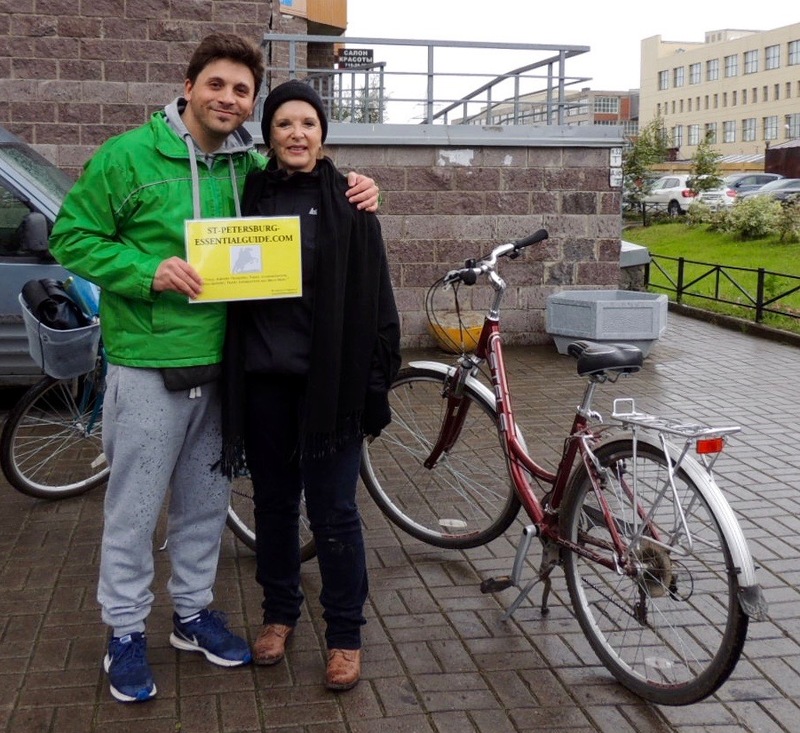 I contacted Davide, explained what I was trying to do, and within one day, Davide laid out a plan for me to see all the great landmarks with a guide, Veronika and a driver, Victor. I know you are thinking…no way I can afford something like that. Not true! Using Davide’s plan was actually less expensive than being “part of the herd” with a tour group. Victor drove Veronika and I to each location and patiently waited for our return. With our special tickets, Veronika got us through doors and gates, bypassing the long lines. She pointed out the important points at each historical site, which made it interesting and less tiring. We ate typical Russian food (delicious). In short…we had fun! 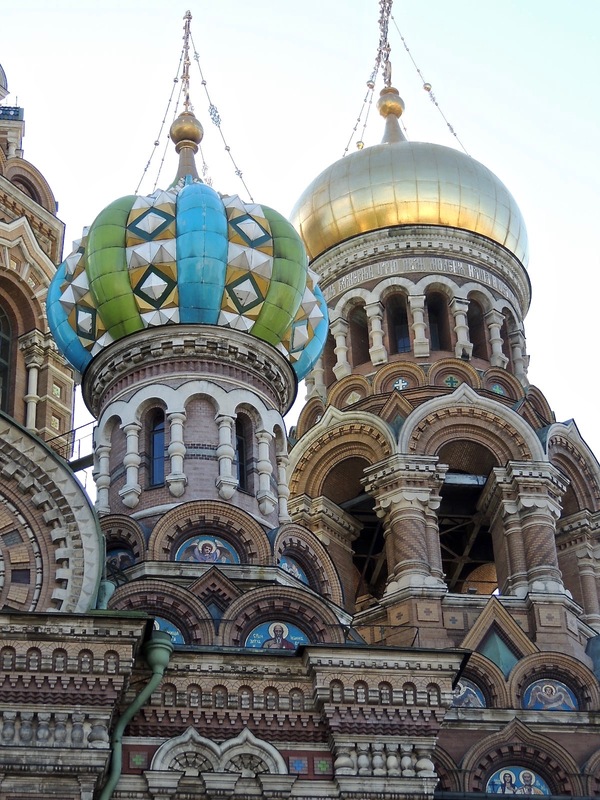 St. Petersburg Essential Guide is the best way to see St. Petersburg. Annie Coburn recently returned from seven months of traveling in South America. In 2010, she created Fab Placez. The name fell short of defining her target audience – mature travelers. In 2014, she changed the name of her website to FAB Senior Travel. She publishes travel articles from other writers, as well as her own, in order to provide diversity of locations to match the breadth of FAB’s subscribers’ interests.